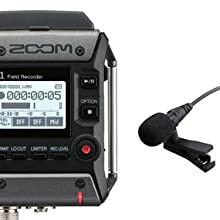 The Zoom F1 Field Recorder + Lavalier Mic is ideal for serious videographers who need to capture the nuance of every word. The F1 Field Recorder + Lavalier Mic completes your video’s story by providing up-close, professional quality audio, wherever your production takes you. 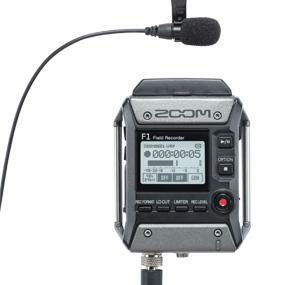 For recording every nuance, the F1-LP comes with Zoom’s newly designed LMF-1 lavalier mic. 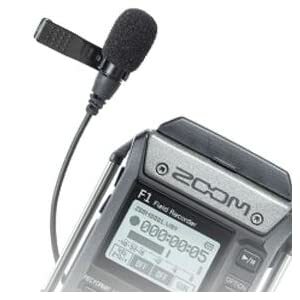 Combined with the F1, you can record audio up to 24 bit/96 kHz, perfect for interviews, weddings, ceremonies, and more. 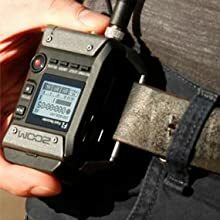 The F1’s low profile design neatly attaches to belts, waistbands, or can be slipped into a pocket to easily hide the recorder. By recording directly to the F1, interference or noise commonly experienced when using a wireless beltpack system is eliminated. 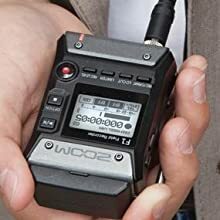 The LMF-1 Lavalier mic connects directly to the F1 and records to a micro SD card. A newly designed monochromatic LCD display ensures visibility even in bright sunlight, while the F1’s one-touch buttons gives you easy access to record levels, limiter control, lo-cut filter and volume output. 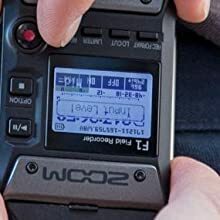 To avoid accidental recording, you can use he Record Hold function or the Hold Switch. The F1 is equipped with an on-board limiter and auto-level control, keeping your levels safe when unexpected spikes in volume occur.